In exchange for freedom for the U.S.S. 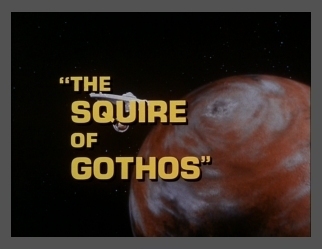 Enterprise and her crew, Kirk offers himself as the prey in a 'fox hunt.' Suddenly, as Trelane is about to kill the Captain, two noncorporeal beings appear. They explain to Kirk that they are Trelane's parents, and apologize for letting their child play such dangerous games. They then scold the errant child for his selfish behavior and temper tantrums. They inform Trelane that he will not be allowed to have another planet to play with until he learns how to treat other beings with respect. wonderful job with the character of Trelane! and so are Trelane's comments about Spock! I feel sorry for him . . . Almost! Now he's just being a wuss! !